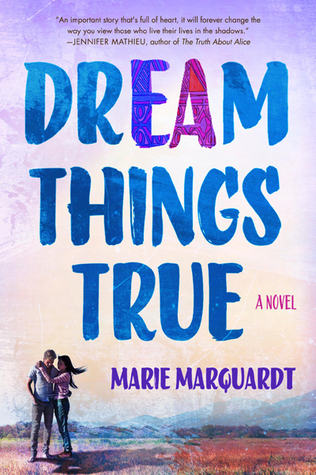 I started off really liking Dream Things True. I had never read a young adult book about undocumented immigrants before and I was very excited to learn about it and hear their story. I was finding the book interesting and complex. I also found Alma a very bright and appealing main character. She was strong and determined to create the best life for herself even under the circumstances. The first thing that caught my attention was Alma and Evan. Their chemistry was great. I saw it immediately in the easy flow of their conversations and was excited to see their relationship grow. I also found it very important that Marquardt chose to write about this subject. I had only ever learned about it in school and reading it as a story made me think of it from a different perspective and let me feel the emotions behind this dilemma. Then I got about 100 pages through the book. I don't know what happened but the book got boring for me. I found the writing and the plot very slow and could only read the book for short periods of time. It just no longer kept my attention. Alma went from being this strong and independent woman to just giving up for most of the book. Evan and Alma's chemistry completely went out by the time I hit 200 pages. Basically everything I originally loved about the book slowly dissipated.I ended up not enjoying most of the second half because it was dragging on and I was forcing myself to sit down and read it. I was very sad because I started off loving the book and I thought it was extremely important a YA author had finally tackled this subject. Sadly, the winning aspects of the book didn't last the full 300 pages. Maybe it was me but somehow the spark for this book went out completely.